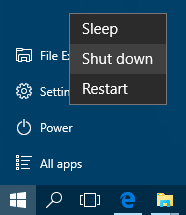 Shut down button is back on Windows 10. After Windows 8 where shutdown PC button was on the side charm, it is on Start menu back to shutdown Windows 10 computer. Using a shut down command from Windows 8 side charm was not accepted by Windows users. Microsoft as changed many things from Windows 8 back to Windows 7 but on a mixed and enhanced version, just like done in Programs menu or in Shut down button. 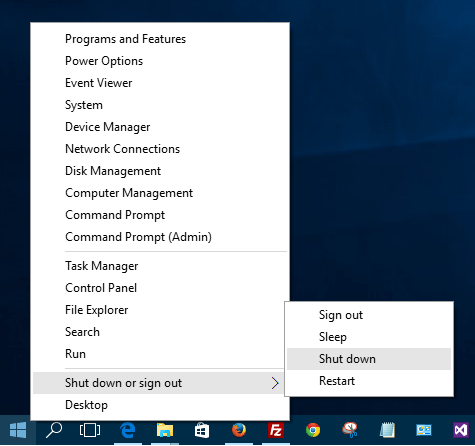 One of the easiest ways to shut down Windows 10 is using the Windows Start menu. So for Windows 10 users this is the right place for restarting your Windows 10 PC, or after you complete your work with your PC you can shut down Windows 10 using power menu options here. There is an other alternative to shut down Windows 10 PC. This time right-click on the Windows Start icon. A menu list similar to programs menu is displayed. Press Shut down from the displayed options.